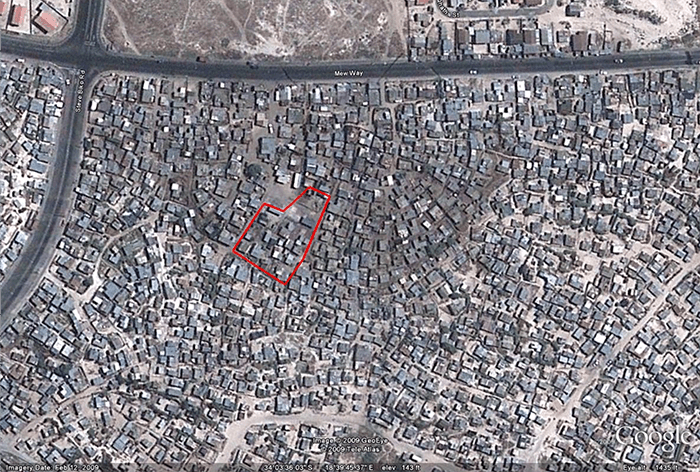 A “Redevelopment Seed” is a small section of an informal settlement that will be researched in depth to provide a complete in-situ upgrading plan. The goal is to develop housing, roads, and other necessary infrastructure in a small area, improving the quality of living in the surrounding area. From this section, neighboring sections can be developed, growing the area that has been improved. This concept was originally developed by WPI students in the 2008 Cape Town Project Center, and has been developed with help from numerous organizations in the area. This is a detailed plan for the creation of a “redevelopment seed” in C-section of Monwabisi Park in the area designated in Figure 1 above. 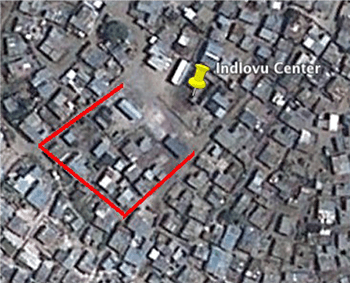 It includes the Indlovu Center, as well as a small area behind the Center enclosed by two roads. The redevelopment seed will consist of new housing, new roads, and community facilities including a crèche, water and sanitation facility, clinic, and soup kitchen. Other essential infrastructure will also be considered especially storm water management, roads, and lighting. The following section examines a location behind the community centre in Section C. This area is roughly 860 m2 and there are approximately ten dwellings on this lot. The ratio of current housing is 1.2 dwellings per 100 m2. The Indlovu Project has identified this area as an initial site for new housing, but is currently discussing the timing and process of this endeavor with the City of Cape. This project would have to be privately funded and self-directed since the City of Cape Town does not have a policy to guide, nor the resources needed to support, new housing in Monwabisi Park at this time. The goal is that this initial site will serve as a model for what housing redevelopment efforts ultimately hope to achieve on a larger scale across the entire settlement. Capital Funding: Obtained by the Shaster Foundation for the first, experimental redevelopment seed. Future funding of public infrastructure is likely under the City’s new Informal Settlement Upgrading Program (ISUP), headed by the VPUU in Monwabisi Park. Funding for housing is undetermined at this point. Tenure: In Monwabisi Park generally, land is presently city-owned and not designated for development, but a process for permitting more formal development in the area is likely to be discussed under the ISUP. Informal tenure arrangements within the experimental housing project will be by rental agreement between the Shaster Foundation and householders. Householders presently living on the site have agreed to transfer their registration tag to the Shaster Foundation in exchange for rights to occupy new housing. Householders will have the option at any time to vacate the new housing and to be reimbursed for the estimated cost, agreed beforehand, of their original shack and plot. Household Participants: all established householders in the target area immediately adjacent to the Indlovu Project community centre wishing to participate, as agreed through community engagement processes. If additional units are available, they will be used for demonstration purposes and/or allocated via through stakeholder consultation. Ownership Structure: A Social Housing Institution (SHI) Section 21 Company will be formed to own and manage the housing. Shaster will transfer housing assets to the SHI following a period of capacity building with residents and management. Management: Management shall be via the SHI, with householder participation. Rent: Householders will pay rent to cover ongoing costs of housing (utilities, maintenance, repairs, sanitation services, etc. ), but not to recover capital costs. Wider Community Representation: The Indlovu Project proposes two levels of wider community involvement in future housing planning; one a Monwabisi Park-wide Forum and the other at the level of street committees. These bodies would guide future decision- making on housing essentials (location, participants, mutual responsibilities, etc.). Should the city in the future choose to become formally involved in housing in the area, then these representative structures are likely to be modified. Until such time, the Indlovu Project welcomes informal city participation in these developments. The community members of Monwabisi Park are currently living in self-built shacks made from materials that are readily available. The shacks are extremely versatile, inexpensive and can be built in a matter of days. Despite these benefits, the shacks face a variety of problems such as leaky roofs, poor insulation and inadequate ventilation. The community members of Monwabisi Park have a strong desire for improved housing (Garcia et al., 2008). In the Section C redevelopment seed, ecoBEAM Technologies is helping to build the Community Centre that the Shaster Foundation is funding. EcoBEAM Technologies will also be a key player in the development of new housing. The company was created by Mike Tremeer to provide low-cost sustainable housing solutions. EcoBEAM buildings are constructed using two pieces of timber connected with a metal lattice framework in between. Another integral part of the ecoBEAM system is the sandbag. Sandbags are the sustainable foundation of this technology because sand is a common resource and can be found almost anywhere. These sandbags are placed within the ecoBEAM frame to create the walls of the building. Once the sandbags have been laid, the walls are then covered with plaster. Further detail on how to construct a building using ecoBEAM Technologies can be found in the ecoBEAM Building Manual here. According to the ecoBUILD website, this technology uses two-thirds less lumber than a typical wood framed house, thus reducing the cost by twenty to thirty percent. The technology is an environmentally friendly and a cost effective alternative to other more conventional building methods. Another beneficial attribute is the thermal properties of ecoBEAM buildings. Much like concrete buildings, the sandbags provide insulation needed to keep houses cool during the summer and warm during the winter months. The majority of construction work can be done with unskilled labour. With the supervision of one knowledgeable foreman, the community members of Monwabisi Park can be self-sufficient in providing the materials and labour necessary for construction. The implementation of ecoBEAM Technologies creates many job opportunities such as manufacturing beams, sewing sandbags, and building the houses. EcoBEAM Technologies also uses minimal tools and does not require on-site electricity. EcoBEAM buildings can be built virtually anywhere. Presently within the settlement, the shacks are prone to fires from unsafe fuel sources and hazardous, informal electrical grids. While these problems should certainly be addressed, the ecoBUILD system is fire resistant (ecoBEAM, 2009). 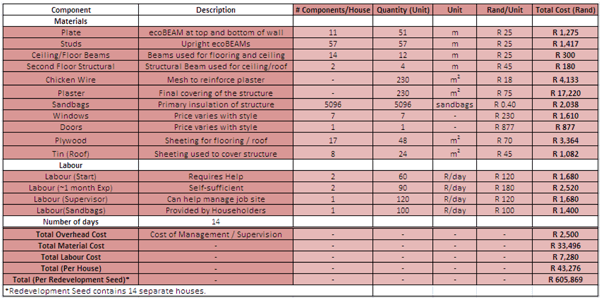 For the reasons outlined above, this report will focus on ecoBEAM Technologies as our chosen method for construction. Currently within Monwabisi Park, there is minimal free space, little infrastructure and little room for new buildings. Cluster units are a convenient way to rearrange existing, but unused free space. They combine the space that would have been between houses into one larger, more advantageous lot. Another pressing issue is cost. 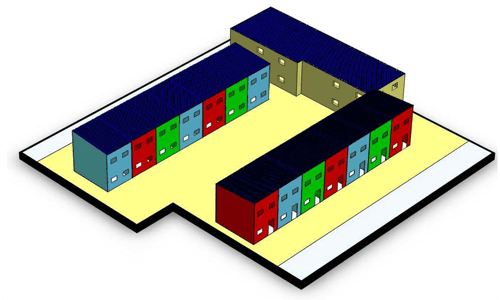 Since cluster units utilize shared walls, they use fewer materials and consequently are cheaper. For these reasons, the advantages of building cluster units within Monwabisi Park outweigh the disadvantages. Although cluster units are a beneficial option, the disadvantages cannot be overlooked. A driving factor of whether or not cluster units are a viable option is the assumption that community members are willing to give up some privacy. Another aspect that must be taken into consideration is ventilation. During the summer heat, many community members struggle to keep their shacks cool and ventilated. Since cluster units provide less ventilation, it is important to address this concern in another way (Saieh, 2008; Garcia et al., 2008). Since ecoBEAM Technologies is a thermally efficient construction method and reduces sound transmission, these are less of a concern. When proposing new designs for redeveloped housing, it is ideal to find a solution that not only conserves free space, but also respects the community’s wants and needs. Building off of the above considerations and initial EcoBEAM designs, the team proposes a two story, simple row cluster unit. In simple row units, each unit shares two side walls with a neighbour while the front and back walls are open to the street or yard. 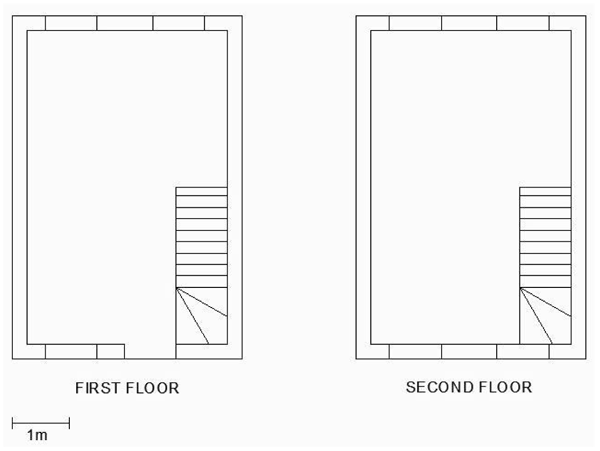 Typically, the units are the same or extremely similar in design. A simple row unit conserves space without significantly hindering ventilation. Each unit still has at least two walls open for windows. Furthermore by keep the building shape a rectangle, one can lower cost and simplify construction. Because the proposed span from front wall to back wall is only 6m, only two structural beams are needed for the entire structure. Our team recommends shed style roofs for the simple row cluster unit. Shed style roofs are inexpensive, can be built quickly and are easy to install. Since funds are limited, it is important to keep construction cost as low as possible. Furthermore by using one of the simplest roof types, it furthers the benefit that ecoBEAM houses can be built with unskilled labour. When shacks are built, residents will often start with a one room home. Over time, they will add onto their shack as income allows. As a family grows, the home will grow, change, and evolve with them. When developing new housing plans, it is important to anticipate growth and keep the community’s needs in mind. New housing plans should allow residents room to grow. At the same time, growth should not disturb roads, free space and common areas (Osman, 2005). By planning free space into the property lot, homeowners could add one story, two stories, or even a garage if need be. Homeowners would have a fair amount of freedom to build based on their needs as their financial situation allows. Although additions will give residents needed interior space, they will also take up free space and decrease the size of yards. Furthermore, additions significantly decrease the ventilation of middle units. It becomes even more important to address ventilation in another way, but since ecoBEAM Technologies is a thermally efficient construction method; this is less of a concern. Building shape and orientation play key roles in promoting a safe and a positive community atmosphere. It is possible to significantly reduce crime and vandalism through sensitive design (Osman, 2006). By orienting houses towards roads and community spaces, one can increase visibility of communal areas. The team proposes that a semi-sheltered courtyard be created between the two row units. The number of rooms varies from shack to shack within Monwabisi Park. There are a few rooms consistent through most houses. A lounge is a room used for socializing and eating. It should be the first room in the house. The kitchen is a place for cooking and socializing. In the interest of cost, the team proposes that the lounge room and kitchen be one open room on the first floor. Two other rooms that shacks may have are bedroom(s) and a washroom. The team has proposed that the second floor be one large room for bedrooms. The householders can later build walls to subdivide the room for more bedrooms as they see fit. The images below shows a CAD model for a single unit of the proposed new housing. 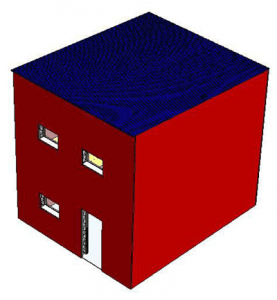 The model is built to scale and accurately illustrates the ecoBEAM Building Technologies building method. By building an accurate model, the team could effectively analyze the cost of each unit by creating a bill of materials. The floor plan for the unit is shown as well as an isometric and exploded view of the 3-dimensional CAD model. The above considerations were compiled into a model that is shown below. In the model, the tan building in the upper right is the community centre that is currently being built. There are two rows of 7 dwellings. There are 14 dwellings in total and the model fits 1.6 dwellings per 100 m2. This is 33 percent more than the current housing condition. Each unit is 6 by 4 meters in size for a total of 48 m2 of total living space. In front of each row there is room for additions or parking. In-between the two rows there is a communal area. This area could be used for the water centre as well as community space. Our team feels that this model is worth further exploring for the redevelopment seed in Section C.
Unskilled (starting wages) – A labourer will earn R60/day until it is clear that the person is capable of doing the job well. Generally, while at this level of skill the person will be assigned tasks and helped through the process whenever problems arise. In order to move beyond, the person must be able to complete all general tasks around the construction site without outside help. Moderately skilled – A labourer will earn R90/day when able to complete any task without help from a mentor. Taylor says that this will take approximately one month for most people, but will vary from person to person. Skilled – A skilled labourer will earn R120/day. In order to be at this level, the person must be able to complete all tasks on the construction site with no outside help and be able to teach an unskilled labourer how to do specific tasks. Also, at this level the person will act as an under-foreman where decisions can be made without consultation with the construction manager. Currently, no one has reached the third skill level at the Indlovu Project, but several have reached the second. With this composition of workers, the job site is still capable of operating efficiently. It is important to remember that one skilled builder must be present to oversee any work that an unskilled labourer has completed. Wages will not be gauged by the task that is completed, but rather by the skills shown on the job. The team took a step towards creating a model for determining the costs of both a single housing unit as well as the redevelopment seed as a whole. 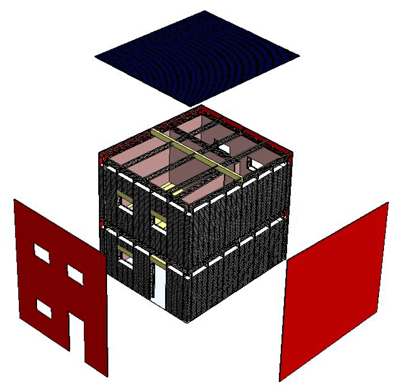 A CAD model of an ecoBEAM house was used to determine the materials necessary to build the entire structure. From the model, a bill of materials was created and this information was then used to create a spreadsheet. The cost per each unit was calculated under a few preliminary assumptions. First, there will be two first level workers, two second level workers and one construction manager employed on the job. Also a two week build time per unit was estimated based on Robert Taylor’s professional opinion. The total estimated cost per dwelling is approximately R43,000. The cost for the entire proposed redevelopment seed is approximately R606,000. It is the team’s hope that this will provide valuable information to redevelopment planners when making decisions about money allocation. The table below shows the pricing output for the proposed new housing. 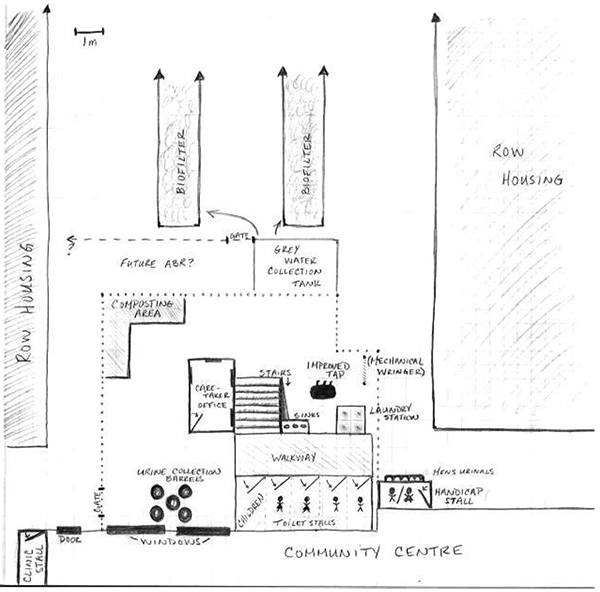 The new Sanitation Centre, designed to accommodate a user load of approximately 200 Community Centre patrons and surrounding residents, will be located directly behind the Indlovu Project Community Centre. The facility will include a dry composting toilet scheme, a laundry station, improved taps, hand washing sinks, a grey water management system, and a caretaker office, all surrounded by a gated perimeter. The current site blueprint provides for seven dry composting toilet stalls and several men’s urinals, with available space for user facility expansion if necessary. The installed toilets will be urine divergent, which will separate solid and liquid waste into individual 200 liter drums. The stalls are classified by gender and age, allowing for two men’s stalls, two women’s stalls, one children’s stall, one handicapped stall, and one stall designated exclusively for patients of the Community Centre clinic. The dimensions of each stall are 0.9 metres in width by 1.7 metres in length, totaling a toilet stall block of 4.5 metres by 1.7 metres. The stalls will be positioned on a raised platform for sublevel access and removal of solid waste collection tanks to a secondary composting area. The raised platform will also act as a walkway of approximately 1.5 metres in width. The total facility area within the gated perimeter will be approximately 80 square meters. Distributed within this space are a 2 x 2 metre area for laundry services, a .5 x 1 metre area for a mechanical laundry wringer, a 2 x 2 metre area for urine holding barrels, a 1 x 0.5 metre area for hand washing services, and approximately 1.5 x 2.5 metres for a caretaker’s office. A grey water and urine filtration system will also be located behind the facility and centered between the proposed row housing. The specifications for this grey water purification system are contingent on future testing conducted by the University of Cape Town and other research collaborations. Due to a tight space requirement around the Indlovu Centre, the width of the roads that border the redevelopment seed play a crucial role in the housing layout. Both 6 meter roads and 8 meter roads have their pros and cons, which must be considered carefully. The roads which are covered by this section are shown approximately in red in Figure 7. If 6 meter roads are used on both sides of the redevelopment seed, then some interesting factors come into play. Since there is a need for parking around the Indlovu Centre, the most logical place to provide this is along the roads that border it. Unfortunately, parking like this cannot be implemented with two lanes of traffic on a 6 meter road because there is not enough space. Therefore, 6 meter roads would be possible only if the road around the redevelopment seed is a one-way road. If the average width of a car is 1.8 meters, then presumably parked cars will take up about 0.9 meters of road space. A buffer area of about 0.5 meters is also presumed to allow for safe driving space next to parked cars. This leaves 4.6 meters for vehicular traffic as shown in Figure 8. The required road width for emergency vehicles according to the 2008 mapping and planning team and the Cape Town Fire Department is 4.5 meters, so this design is just wide enough. If 8 meter roads are used, then it will be possible to have two-way roads if parking is allowed on one side of the street. If the same assumptions are made as before, 0.9 meters will be reserved for parking and an additional 0.5 meters will be allowed for a buffer area. This gives 6.6 meters of driving area. If there is a lane going in each direction, then each lane will have approximately 3.3 meters of driving space. While this is wide enough to comfortably fit a car in each direction, emergency vehicles will use up more than one lane. In emergency situations however, this shouldn’t be a problem. The diagram in Figure 9 shows this schematic. Two lane traffic would make transportation much easier but it also would require much more space, and thus affect more shacks than a 6 meter road. We recommend that low mast lighting be used in this area. Low masts should be placed along each new road as it is constructed as well as in between the houses to improve pedestrian safety. Low mast lighting is recommended over high masts because the area will be well-defined and permanent. In addition, it gives a more personal feel to the area and will improve brightness. The low masts will be easier to construct in the cramped conditions and will be easy to maintain with the addition of paved roads. Storm water management is a complex topic and requires significant amounts of testing and planning prior to implementation. Implementing a poor plan can cause many more problems than it creates. As a result, any plans discussed here are theoretical only and will require more planning by properly qualified personnel. There are three main methods of dealing with storm water: soaking it into the ground, channeling it away from the area, and capturing it in a reservoir. Allowing water to seep into the ground requires time and the appropriate ground conditions. The composition of the soil and the water table are key factors that would have to be tested. In addition, rainfall must be carefully considered as too much rain too quickly can overload even the best conditions. Channeling water away from the area is an effective solution for the area, but it must have somewhere to go. Running water causes flooding and erosion and the area through which it flows must withstand the environmental pressures. Capturing rainwater is easily accomplished by catching water from roofs in large barrels. It can also be accomplished on a larger scale by using an in-ground reservoir and a channeling system. This can greatly reduce the amount of water that must be dealt with as well as providing a source of fresh water. Like seepage, it can be overwhelmed; however, and suitable back up measures must be taken. In addition, it cannot capture all of the water, and any rain that falls straight to the ground must still be appropriately handled. The best solutions usually use some combination of these three methods. In addition to storm water, there will also be greywater deposited from the water center that is planned to be installed near the Indlovu Center. Plans will have to be made to decide whether to keep this greywater separate from storm-water, or to process them together. According to a study performed by Kevin Winter, et al., they have determined that on-site disposal of greywater in Khayelitsha RR is not recommended due to a high greywater generation rate (2764 l/ha?d) (Carden, Armitage, Sichone, & Winter, 2007). It is currently uncertain if this applies to Monwabisi Park as well, but the near proximity makes it a possible issue. The micro storm water management in the redevelopment seed area could consist of a few different elements. The roads to the east and west of the space have a proposed design to be 6 meters wide, which means there is space to incorporate a drainage system in these roads or a channelling system from these roads to Mew Way. If the terrain is adjusted to angle towards the roads, much of the rain water would naturally channel to the roads with the drainage system. A dditionally, all the new housing which would be implemented in this area could contain gutters and water basins, collecting the rain falling on the roof and eliminating some water which will flow to the roads, ultimately decreasing the chance of flooding. A lthough soakaway systems are another practical option in this circumstance to prevent water from collecting in one concentrated area, the location of the water table is higher than the ideal level. A fter one test in this area, it was concluded that the top of the water table is 72 cm below the ground surface. Idealistically, the water table should start 2 meters below the ground surface. In addition, much of C Section was built upon a landfill, so there is a good amount of garbage which would disrupt the soakaways. These options are no more than recommendations and should be tested and researched further. However, since most of the park has similar terrain, a storm water management system which is efficient in this experimental area will most likely be efficient throughout the park as well.